Disco 2000, 8a+ Blåmman from Dave MacLeod on Vimeo. 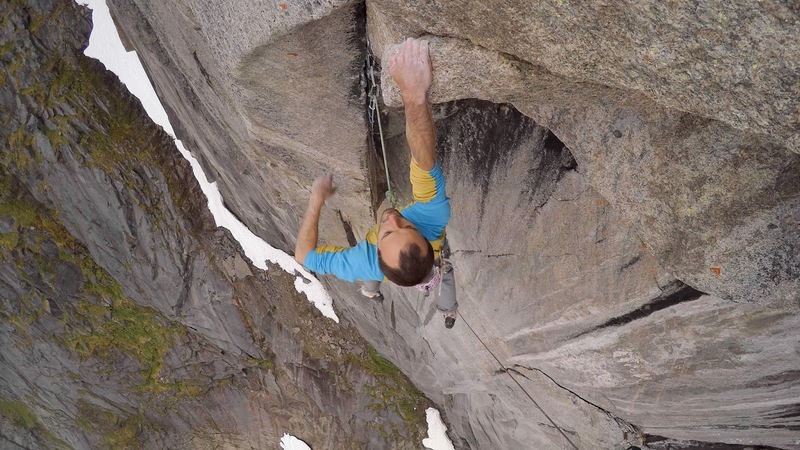 The video above takes in some of the great climbing on Disco 2000. 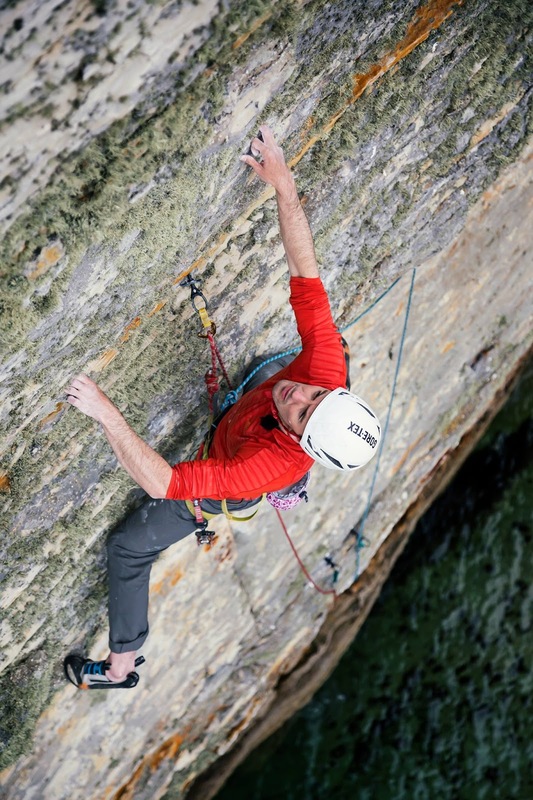 The pitches went at 7b, 8a+, 7a, 8a+, 7c, 7c, 7b+, 7a, 7a, 6a, 6c, 6b+, 5+. 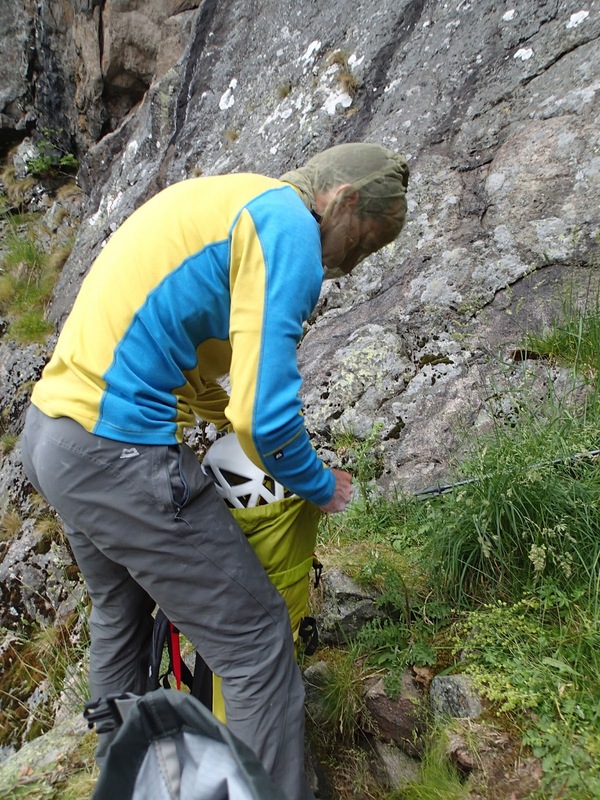 It was while freeing Bongo Bar on the north face of Blåmman, 4 years ago that I got the spark of curiosity to try to free Disco 2000. Looking across at the maze of roofs to my right, I saw a bolt belay looking lonely in the middle of nowhere on a blank looking granite wall. Huge roofs above and below. I could picture Marten Blixt hand drilling them by headtorch in some blizzard during their winter aid ascent in 2000. 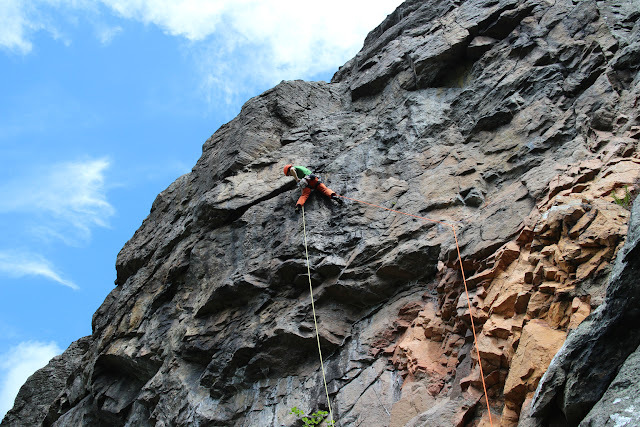 After 4 days of sitting in the rain in our tent below the wall, Jacob and myself were desperate to make more progress in aiding up to that belay and finding out if the line was even possible to free. We continued aiding through the ‘night’ (the midnight sun period had just passed) and made it up to bolts. 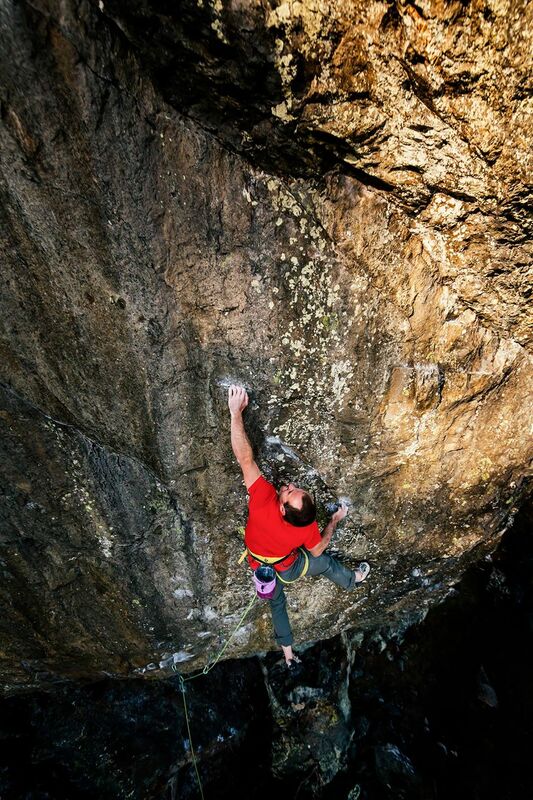 There were definitely enough holds on the crux pitch. However, the next roof, which was split by a soaring finger crack, was completely soaking. Returning to our tents to sit through some more days of rain, we began to realise that wetness was going to be a major problem for us in trying to free this line. Calum Muskett arrived, bringing a couple of dry days with him. Jacob and I were so impatient as the wall started to dry out again that we raced back up to try the Arctandria corner at around 11pm. On the crux of pitch 2; the Arctandria corner (8a+). Disco 2000 shares the first two (and crux) pitches of Arctandria before breaking out left through the roofs. Arctandria was first freed in 2005 by Didier Berthod and Giovanni Quirci. The immaculate 50 metre open groove on the second pitch went at 8a+. We were both rather intimidated by it. It turned out to be a bit easier than we had worried. Perhaps a combination of mutual keenness to climb it, and cool conditions of the middle of the night helped. After working out the moves and gear placements, Jacob went first and dispatched it. His telescopic arms spidered through the whole crux section in two moves. I went straight afterwards. It was after midnight and a little hard to see the odd foothold, so a few smears were improvised in a hurry. After going down for a rest as it got light, we climbed back up the fixed line later the same afternoon and I finished cleaning the crux pitch while Calum worked on the Arctandria corner. Later on it started to rain again. 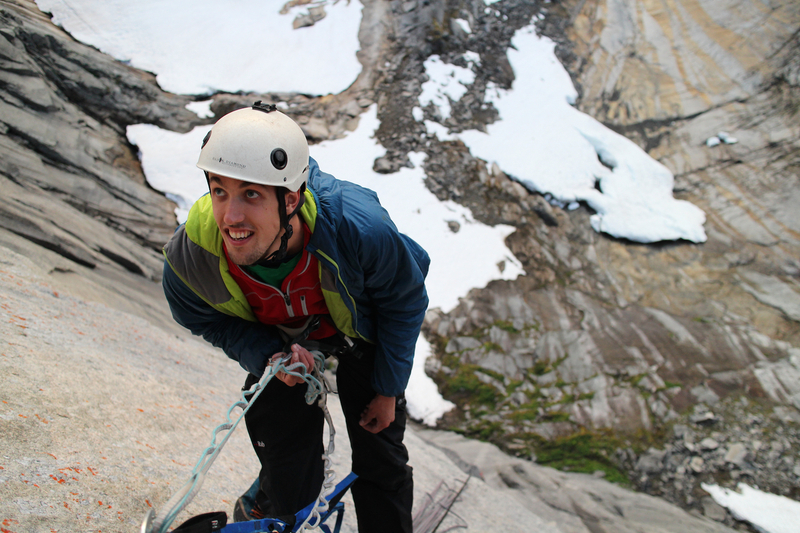 Calum descended the fixed rope first, and as myself and Jacob descended, I noticed the temperature dropping. I stopped and asked Jacob if I could try the crux pitch now. 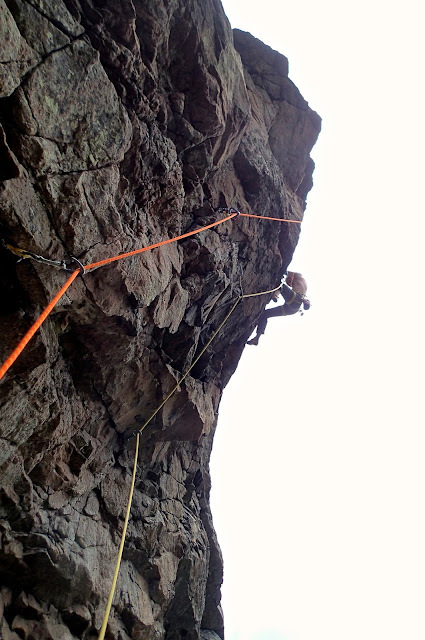 As it turned out, while I led this, Jacob was getting steadily soaked by the rain on the hanging belay below me. On the roofs above, I didn’t even notice. I was in my own bubble, absorbed by this brilliant varied pitch. The load carrying involved in remote big walling has been a little hard on my still recovering ankle, so just now I feel such pleasure to step into rockshoes and move freely without pain, or having to concentrate on every step to avoid it. Still, I was anxious not to take a long fall from the delicate final groove to the belay, the result of which would have been a nasty slam into the wall. We also took turns to free an unbelievable finger crack through the next roof. Even though the fingerlocks were wet, it was still one of the best pitches anywhere. Jacob joked that there ‘might be some crimp on the lip’ to help us pull over where the crack thinned. I agreed outwardly. Inwardly, I thought ‘there’s no crimp up there!’ As it happened, there was the most badass jug exactly where you’d want it. Swinging footless from this proves a spectacular finale to the roof pitches. The rain prevented us from doing any more, so we went down. But the next morning the sun was shining and the air seemed really dry. The upper pitches had had seeps of around 100m in length after all the wet weather, but today they looked much shorter and more broken. So we blasted back up the ropes to start trying the upper pitches. 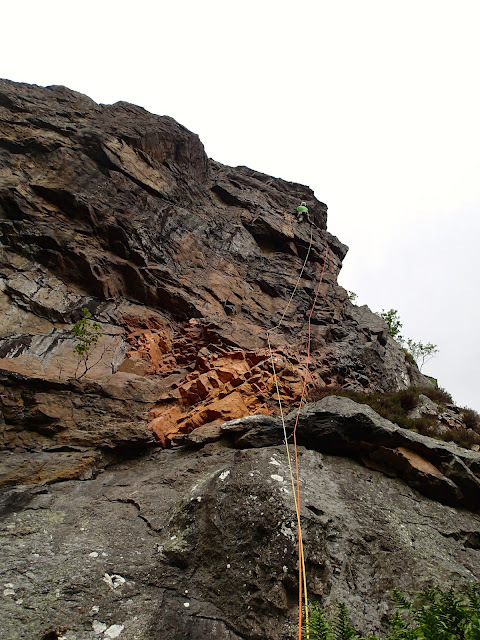 Jacob and Calum had a good tussle with another E7 pitch of laybacking and slippery undercutting. The next E7 above had a worrying gap between holds where the aid line pendulums. It needed cleaning which I did as quickly as possible and then Jacob asked to jump on the lead. He wanted to try and dyno sideways across the gap. He clearly likes and is good at dynos. 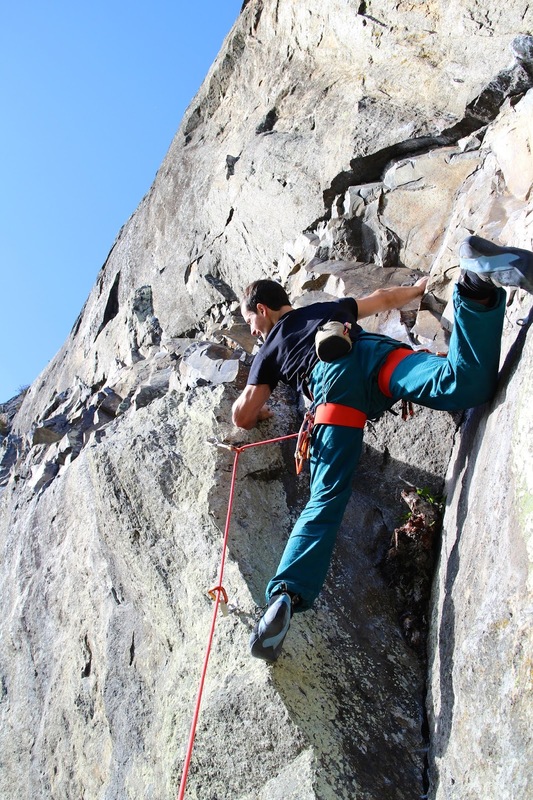 But when he flung himself at the hold, slid off it and hurtled down to join me on the belay stance, I suggested he look at the crimps just above. He wasn’t having any of it. Instead, shaking with a wee dose of adrenaline, he scuttled back up the flake and took off sideways again. This time he stuck it. I knew there was no way he’d let himself fall off the sustained E6 climbing that followed. So I relaxed and waited for my turn. I found a technical traverse on sidepulls just above and next thing we were all hanging awkwardly from the next belay. At this point it was nearly midnight, it was clearly raining to the north and south of us and we knew the next 4 day spell of rain was due to hit in a couple of hours. It seemed like continuing would almost certainly mean a cold and wet retreat from near the top of the wall. On the other hand, if those pitches were easier, we could just make it. They still looked wet and we knew that this moment was likely our only realistic chance to complete the free ascent. So we carried on, first with a soaking wet E4 groove. I slithered and power screamed my way up it. It wasn’t pretty, but I got to the next ledge. The following two pitches went a little quicker in the gloom of the night and landed us on a ledge with two pitches to go. The rain clouds looked like they were just a few minutes away. To be honest, the rain wouldn’t have made much difference to the next pitch. 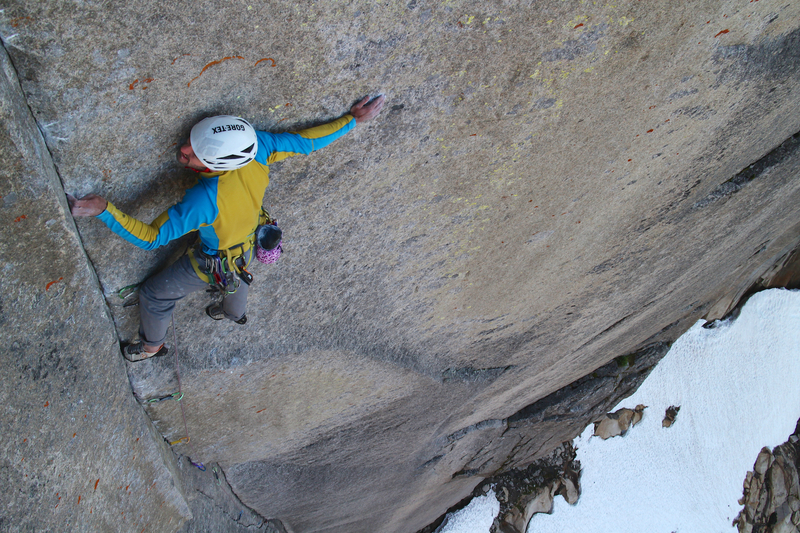 I climbed it by pasting the back of my Gore-Tex jacket on the wettest, moss ridden side of the groove, while leaning both feet out to the driest footholds out left. A ridiculous technique to look at, and to do, but I got higher. Every so often I lobbed dripping lumps of turf over my shoulder to reveal soggy handjams beneath. I slithered across a bulge that would be easy in the dry, getting really pumped. I shouted to Jacob that I couldn’t hold on to the wet holds any longer. He didn’t believe me. If it wasn’t for a wee kneebar on the lip, I would have been right. 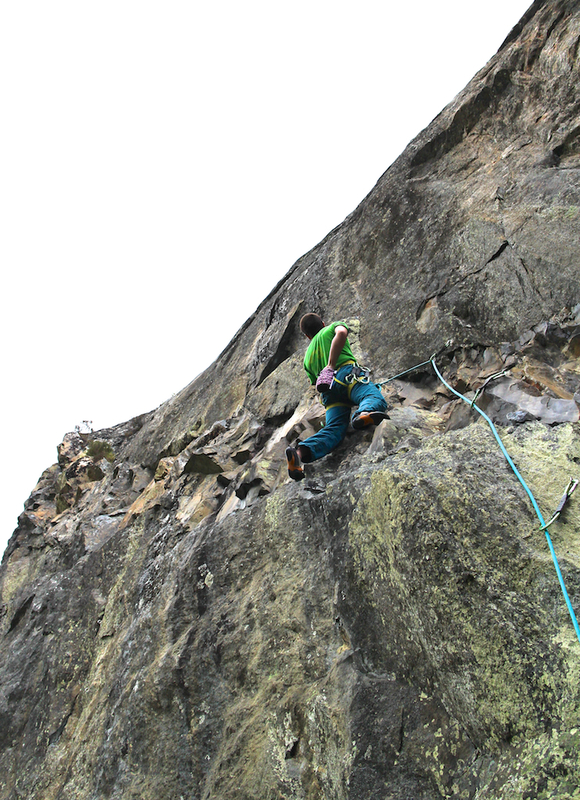 In the end, the rain started just as I pulled over the last pitch of proper climbing. Within 5 minutes we were completely soaked and water was pouring down the rock, but we scrambled to the summit, happy. With the all the route now freed, we would have returned to make a single day redpoint which is definitely possible. But after more days of rain, the face was soaking again, so we didn’t get to even try. I was still really happy that we managed to take every moment of dry weather to get all the pitches freed in the 50 hour, rain interrupted sessions we did get. The locals we met in between the solitude of our camp below the wall were extremely friendly and kind to us. Both the climbers and the various people we hitched lifts from. It made it such a nice experience on top of all the great climbing, and this left us very impressed by the community in this part of Norway. 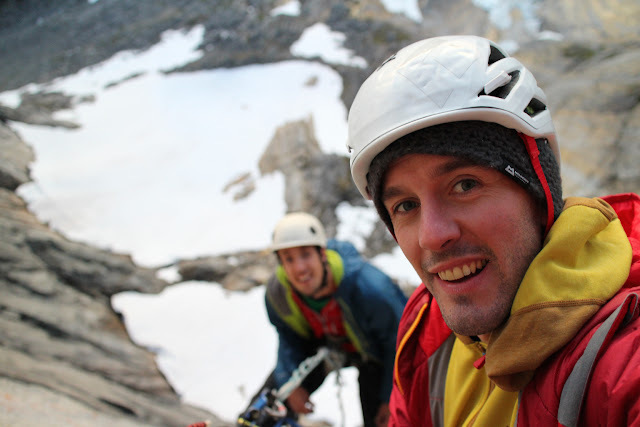 Myself and Jacob Cook enjoying another night shift on Blamman’s north face. 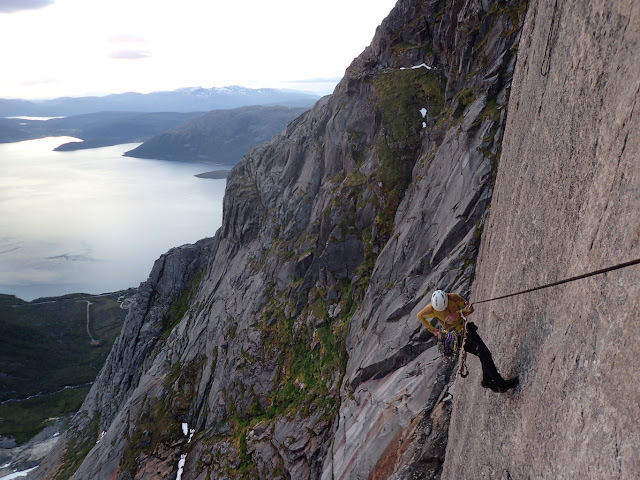 Right now I am in arctic Norway with Jacob Cook and Calum Muskett, climbing on Blamman’s north face. I was here 4 years ago on a Gore-Tex Experience Tour trip and made the first free ascent of Bongo Bar (400m, 8a). While I was dangling around on Bongo Bar I remember looking to the right and seeing the aid line of Disco 2000, going through roof after roof of rather blank looking granite. I remember seeing a bolt belay, seemingly in the middle of nowhere on a smooth face between roofs. At that moment, spark of curiosity was opened in my mind to see if this could make an obviously really hard free route. And so now we are here, trying it. The first few days have been a little slow in progress. 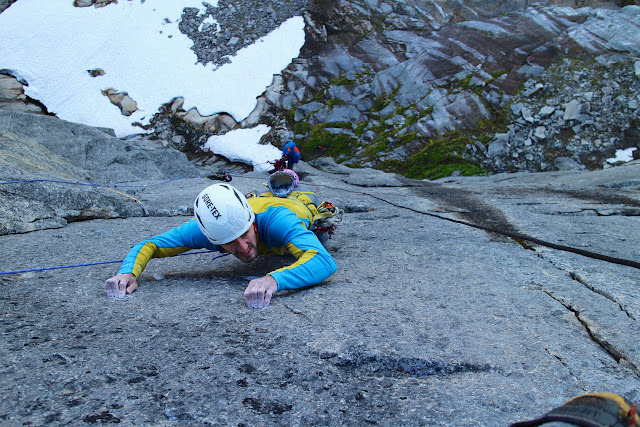 We have aided through the crux pitches in the first half of the route and done some cleaning and investigating if there are enough holds to make a free ascent possible. We have done nearly all the moves on the three hardest pitches now, all F8s. But we have also spent a lot of time sitting in the tent, listening to the rain falling. 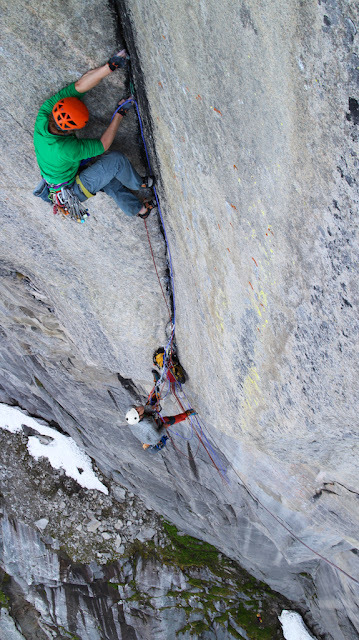 So it’s looking like our time will be too short to free climb so many hard pitches. One of the hard pitches is still dripping wet with seepage too. But we’ll see. Whether we can or not, so long as we find dry rock, I'm sure we will have a good time and a good workout. 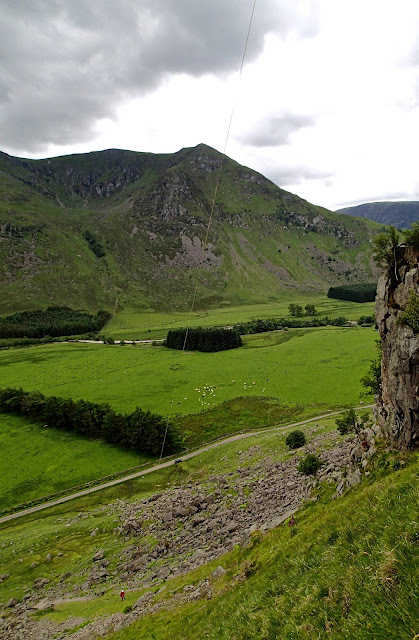 Waiting for the breeze to come back at the base of Bark at the Moon E8 6c, Glen Clova. Photos by Masa Sakano. Last week I went for a wee wander about Glen Clova. 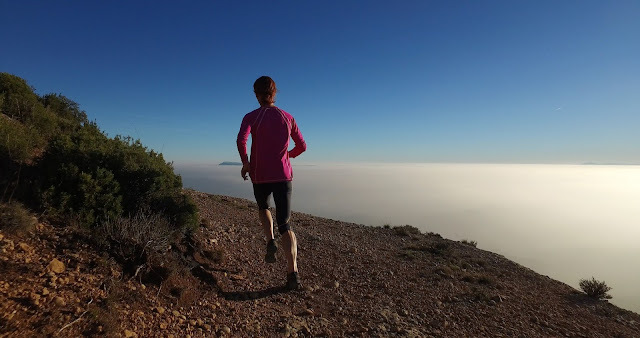 I hadn’t been there before and checked out a couple of routes I’d heard about. One was Tim Rankin’s E8 6c Bark at the Moon, a great looking line up a big steep prow. I felt it would be a good milestone to build a bit of confidence in my trad climbing. I worked out the moves quickly and was desperate to get back with a partner and give it a try. So yesterday I returned with Masa to try and do it. Masa started with an impressive tussle with Empire of the Sun and it was great to watch him top out after really going for it. I seconded and didn’t feel I was moving very well. But it was just the strong sunshine I think. We abbed into the start of Bark at the Moon and conditions felt much better. On the headwall of Bark at the Moon. After a quick wait for the sun to go behind a cloud, I headed upwards. The route is pretty bouldery so you have to move quickly. 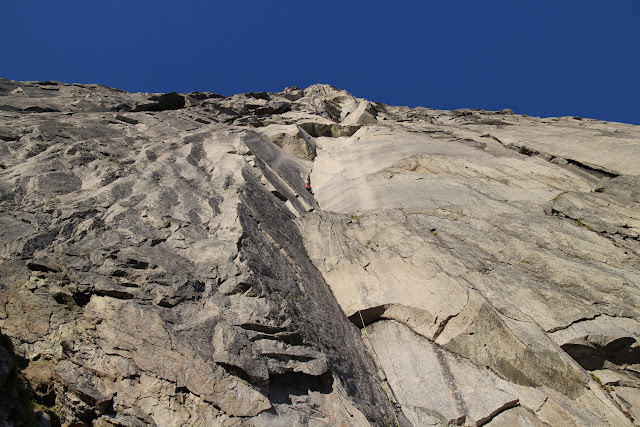 Before I knew it I’d moved solidly through the crux and noticed myself letting out a deep breath to relax a bit and enjoy the pumpy upper headwall. Although I felt strong and solid on the crux, I’m aware that I am still feeling rather self-conscious in my movement - I am still climbing up the rock thinking about my ankle rather than about nothing. I can see it will take a little while yet to lose this feeling and be able to enter a decent state of concentration on the rock. Although I wasn’t totally relaxed, I was still very pleased overall to have made another little milestone of progress. I feel I should probably do another few E8s before progressing back to E9 again. Ab rope stuck in a crack. Got there eventually. The midges we waiting for us to decide to do one more route. We thought better of it. 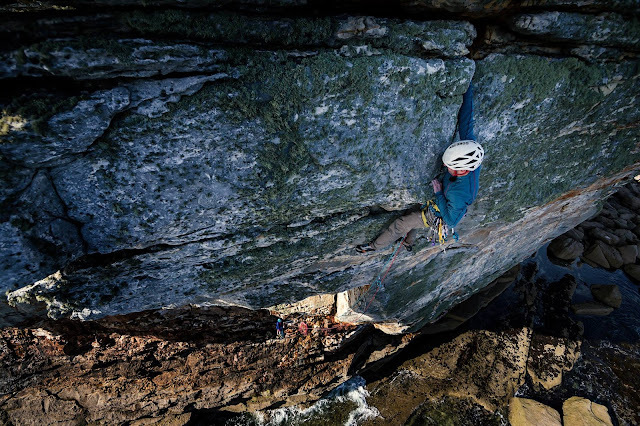 Transition Film Preview - Toast E7 6c 1st Ascent from Hot Aches Productions on Vimeo. Last week I visited Suidhe Biorach on Skye for the first time, on a cold and windy day with Natalie. 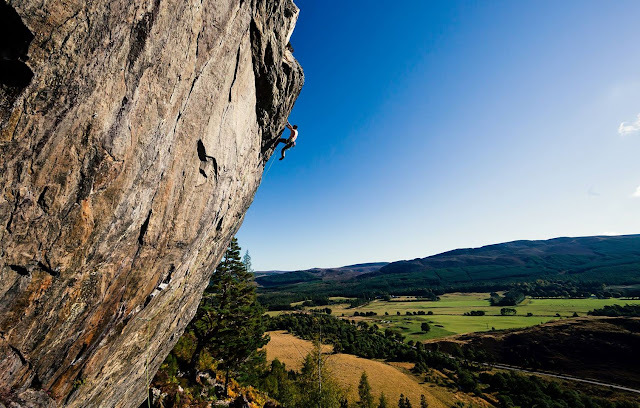 There are still plenty of great cliffs around the highlands that I’ve never visited, and I always have the hope of discovering good hard new routes to climb on them. That day we climbed Mother’s Pride, the big classic E4. Mega steep, mega jugs. At mid height I couldn’t help noticing the massive horizontal roof to it’s right. At the right end of this, Hovis (E6) crosses the roof at a narrower section with good flakes. But I could also see the odd ripple in the expanse of roof in between. At the end of the day I abbed down to have a look. At first it looked like there weren’t enough holds, but then I found one section of roof with just enough holds. I had to come straight back for this amazing line! A couple of days later we were back. I abbed down again, giving the pitch a clean and checking out the gear and holds. It looked like it would go, but one move to spin round and toe hook the lip while holding a slopey press in the roof looked tough and was hard to try off the rope since the roof was totally horizontal. It was gently raining although none of it was really bothering the route. So after a bit of hanging around we just abbed down and got on with it. You can see how we got on in the video above. The line was one of the best I’ve done in a long time. 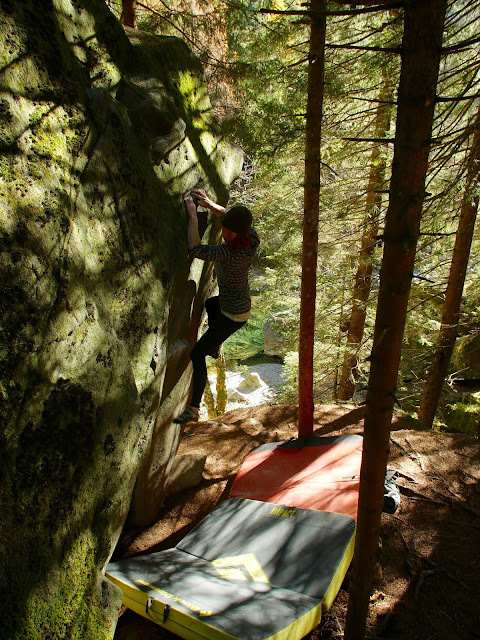 A great boulder problem in the roof, followed by a chilled out dangle about on the lip on big jugs and then a fun pumpy headwall with bomber gear. It’s obviously going to take me a little while to build up trad stamina after so long doing pure strength work while I was off my feet. This pitch was basically perfect for me right now. After we had finished it was mid evening and had been raining most of the day and getting steadily wetter. I asked the team what we should do now. There was a suggestion of going for some food. 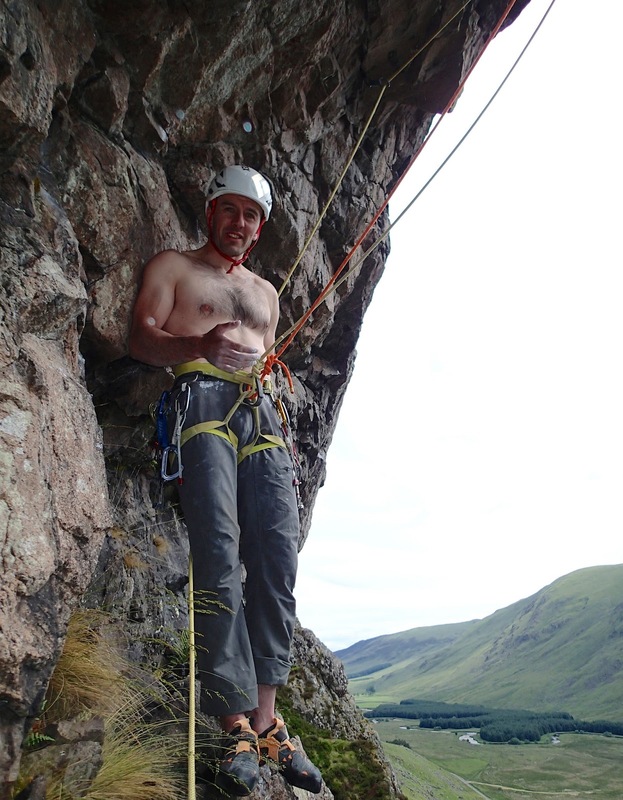 I was keen as mustard to be out climbing and suggested we go down for another E6. After a brief pause I said “Only joking”. Diff said “Oh good” and we headed off. I wasn’t really joking, I wanted to CLIMB! This week I’ve been staying in Blair Atholl with my family and trying to get out and run as many laps on Silk Purse down at Dunkeld as I can. That is definitely having some effect on the endurance. Hopefully enough to take another wee step up next week. The fantastic pumpy headwall on Toast, E7, Suidhe Biorach. First post surgery route. Just a 6b at Brin Rock. It was raining, it was midgy, but it still felt great. After a spell of climbing on my recovering foot on big footholds (and trainers) on my board, I graduated to putting my rock shoes on again. At first I just stuck to the board but I’ve now been on the rock as well. Naturally it feels great to be climbing again. I have been noticing the extra strength from all the foot-off training too. There are some challenges still ahead though. My foot is weak and still a little sore on the odd move. Smearing on slabs is still requiring a bit of care, and I’m quite timid on jumps. My outdoor sessions have only been the last week and so far I’ve been just doing mileage on easier bouldering up to 7B. Yesterday I went to Neist Point on Skye with Natalie. Nat made a fine lead of Piggy Bank (E3 5c), starting off in drizzle, finishing in full on rain. Just as we were packing up to leave, the clouds suddenly cleared and so I gave the arete left of Piggy bank a quick clean and led a new E6 6b, Austerity Lite. I wondered if it would feel kind of weird being on a trad sharp end, pulling on tiny crimps. But it was totally fine. It is still difficult to hold back and be very gentle in my climbing, especially as I've been training myself to be explosive with the upper body with foot-off climbing for three months. During the next week I'm hoping I'll feel good enough to try something a little harder. 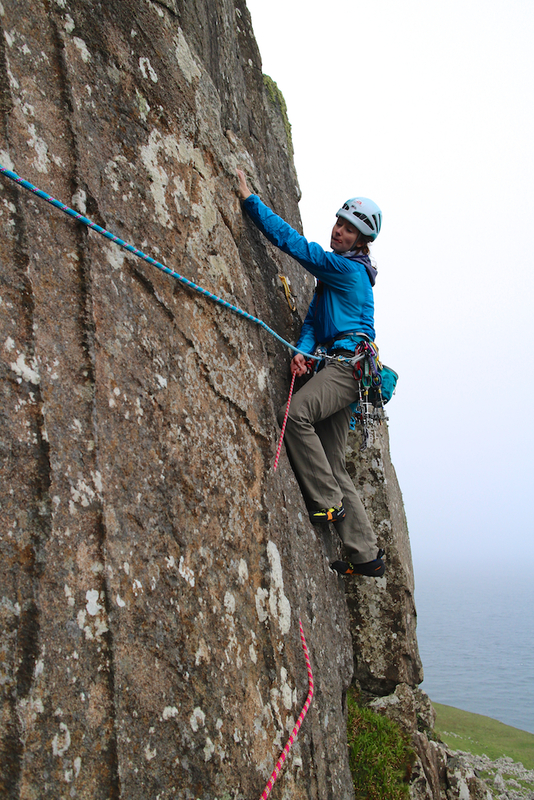 Nat starting off on a damp Piggy Bank E3 5c, Neist Point. 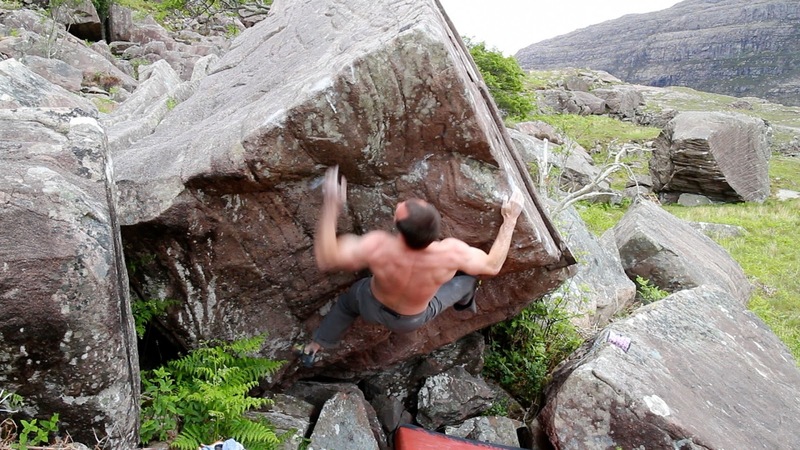 Going for the finishing jug on Potential 7, 7B, Torridon Boulders. Dave MacLeod systemise campusing and 1-4-7 campus board from Dave MacLeod on Vimeo. During my surgery rehab I have done a LOT of climbing without my feet. Unsurprisingly I have got a little stronger. I have been training more or less every day for 2-4 hours. Around half the work has been fingerboard and campusboard workouts. I’ve also done some foot-off bouldering on both small and big holds. Another big chunk of the time has been endurance circuits of around 30 moves, performed with one foot. I started off trying to do these foot-off, but the intensity was a bit high, so I’ve settled for one foot on but keeping my trainers on. I find that if I put on the rockshoe it feels too much like normal climbing and it torments me that I can't use the other foot. It will be interesting to see the effects of this training. 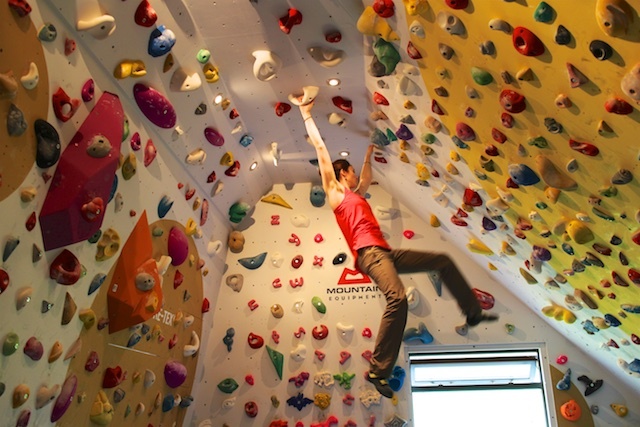 On one hand, it’s still fairly ‘ugly’ climbing on one foot and therefore not great for improving your efficiency. On the other hand, sustained endurance terrain on powerful juggy terrain is a weakness for me, so it may have been useful. I’ll find out in due course. The final big chunk of my time has been taken up with all the peripheral stuff that is A) not actually that peripheral, and B) normally gets missed. I’ve really improved many aspects of my core strength and arm strength and completed what rehab exercises I was able to do before getting to the full weightbearing stage. I’ve been starting to use my foot progressively more on the board over the past few weeks now and getting pretty close to my resumption of outdoor climbing. 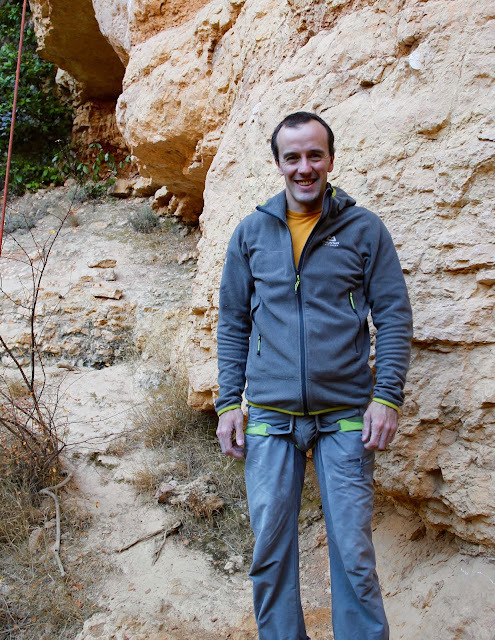 I want to make a solid start to normal climbing, so I'm leaving it until I'm sure I can do that. As this gets close, yesterday I had a nice little milestone of getting 1-4-7 on my campusboard (small Metolius wood grips rungs, 22cm spaced). 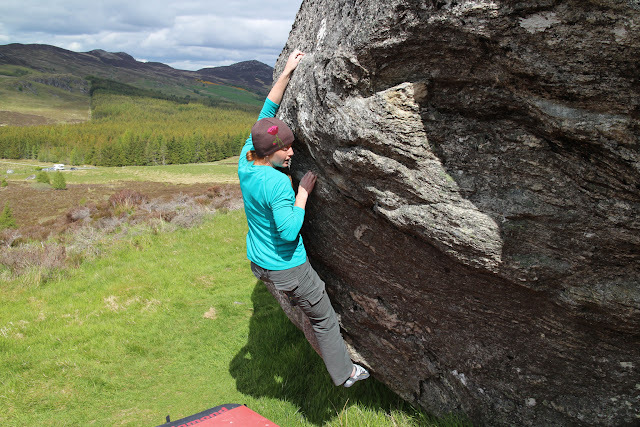 I have done almost no campusing for years now, Partly because the climbing walls I had access to when I moved away from Glasgow in 2007 didn’t have any, and then from 2008 after my elbows started to complain and I just stuck to climbing only. When I built my new climbing wall last spring I included a campus board and used the small Metolius rungs which are a fair bit harder than the old S7 small rungs in the Glasgow Climbing Centre board I used to train on. I could do 1-5-8 on that one and 1-4-7 pretty easily. I stayed away from the new campus board last year while I built a level of resistance back up after the previous year without a board to train on while I was in the process of moving house. Right after my surgery, at the end of March, I started to play on it gently at first, and progressively doing a little more each week. A couple of times I felt I’d overdone it and left it again for at least 5 days. In those early weeks, I couldn’t get near 1-4-7. So to be able to do it now is a clear strength gain. You don’t get too many of those after 20 years climbing! My experience of really dedicated spells of fingerboard or similar organised strength training is that apart from the initial few weeks of rapid gains, the gains you make are so small they can be hard to notice, especially if you are fit enough to train every day and so not coming to the board in a fully rested state. The time you notice it is generally months down the line, when you have had time to go and integrate those new strength gains into your technique on the rock. So bring on the projects, the time is just around the corner! Echo Wall and Longhope DVDs now £5. The BBC Great Climb on Sron Ulladale (first ascent of The Usual Suspects E9 7a with Tim Emmett) now £10. 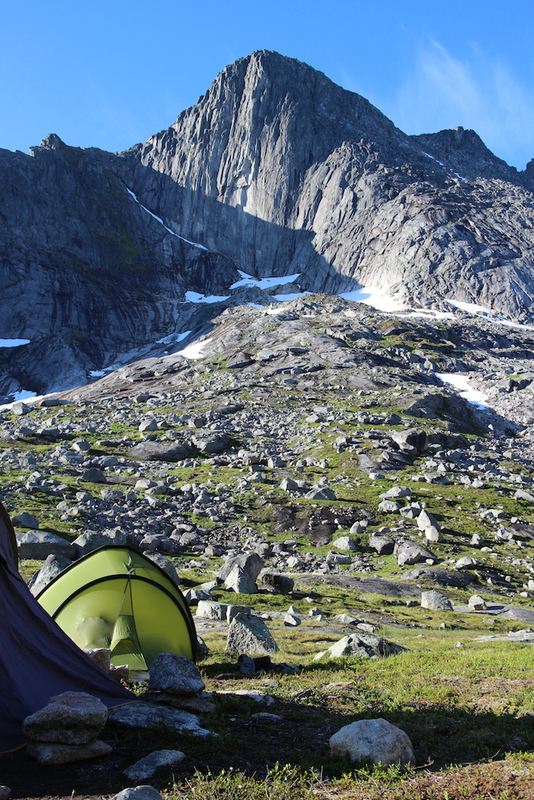 The Triple 5 DVD (5 first ascents between E5 and E8 on 5 Hebridean Islands in 5 days) now £10. Plus 50% discounts on some of our Mountain Equipment clothing. Here is a wee film we put together about Robin Campbell for this year’s Fort William Mountain Festival. As well as Robin himself, it also features Jimmy Marshall, Paul Brian and Ken Crocket (thanks for joining in the singing Ken!). 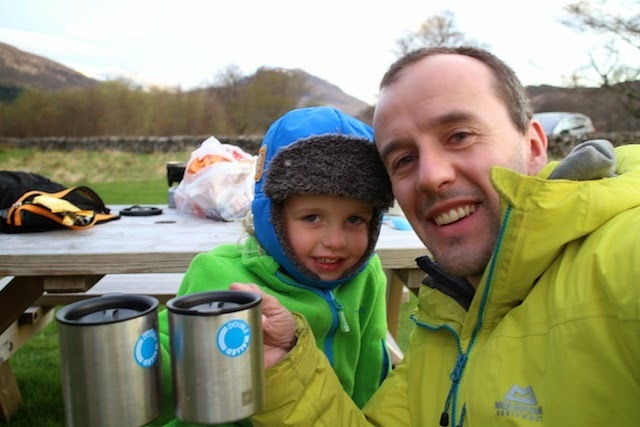 Camping at Creag Meagaidh with Freida a couple of weeks ago. One of the highlights of the last couple of months. When I last wrote on my blog I was not long out of ankle surgery and feeling decidedly delicate. 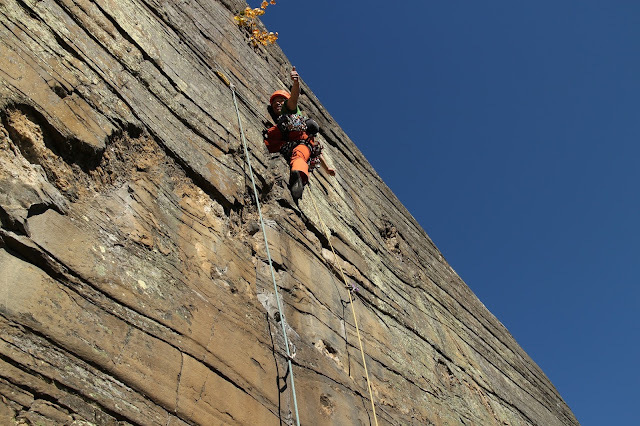 But I felt ok - I had experience on my side and was well prepared with a plan of action for the recovery period, mostly consisting of hanging from small holds without my feet. 6 weeks later some things have changed and some have not. I am still feeling rather delicate, although my ankle has made steady progress. I am beginning to use it gently on my steep board and very close to walking without my crutches. But not quite there. My fingers have definitely become a little stronger and will hopefully get stronger still by the time I am able to climb a piece of real rock again. There are still various things on my ‘stuff to do while out of action’ list that are undone. But I suppose I have done the most important ones. Despite the preparedness, I have felt the process mentally tough as ever. Perhaps some readers might be curious as to how I would live out my own advice in part 5 of my book Make or Break, where I propose a mindset and tactics to turn the mental challenge of a rehabilitation period into a positive experience. In that chapter I begin by reiterating that noone should underestimate how hard an injury rehab will hit them, if they are truly dependent on sport and exercise for their well being. Then I go on to lay out how to use the period to increase that well being, at least in the long term. These two messages go hand in hand. Yes it can be positive if you do everything right, but that doesn’t make it easier. You still have to go through it, not around it. And so to be plain, I have felt the fear and the depression, just as I did after my previous surgeries. Fear that I won’t recover and depression from withdrawal from the places and experiences that I love so much. My approach to dealing with this is very much in The Stoics school of dealing with challenges: to face them head on rather than ignore them with positive thinking. In my view, this is the only effective way to deal with significant worries or problems. Aside from that, I find that if I think too much about what I plan to do after I can walk and climb again, it gets harder to remain patient and go through my daily routine. Pulling on small holds on my wall has or course been a brilliant catalyst for getting through the period. I have thoroughly attacked the campus board, fingerboard and foot-off problems. I wouldn't say I’m the strongest I’ve ever been. But not far off it. Such a short time isn’t even nearly enough to make such an impact anyway. I’ve found that doing one foot circuits have been the most challenging simply because they are kind of unpleasant to do. But it’s all relative - They are not pretty compared to normal climbing, but I still love doing them compared to doing nothing! I also spent about a week resetting the whole board and making and adding more holds. I still have a week before I check in with my surgeon and talk about dropping the crutches and putting my rock shoes on again. And even once I do, I still need to make time to ease into climbing. So there is still time to work a bit more on my full crimp strength and build a little more endurance before I return to the ROCK! One of the things I've done over the past three weeks is learn to fly our new drone, or try to at least. I'm still pretty bad at it, but it's good to learn something new. It has also allowed me to go outside while I'm on crutches, if not so far from the car. Below you can see some of my practice, filming my brother Alan MacLeod practising his pipes in Glen Roy and Glen Nevis before my sister's wedding last weekend. Alan MacLeod piping from Dave MacLeod on Vimeo.